kelbysews: A New Baby and My Very Own Quilt! 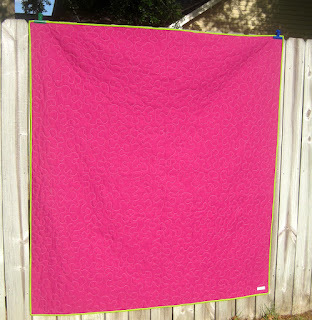 SHOP NEWS: I'm moving at the end of the month so from now until April 20th you can get 20% off in my shop (excluding custom order quilts) with the code "BIGMOVE" Please help me clear out my shop so I don't have move more stuff! :) Tell your friends! I set a new land speed record with this quilt! I found out a little after 1pm that my husband's cousin gave birth to her first baby. By 5pm, I had a completed quilt! It would have been done sooner, but I kept changing my mind on fabric! I used my Wonky Alphabet letters. I backed it with some pretty red and aqua Bliss print! Voila! A baby quilt in the space of an afternoon! I also completed the quilting and binding for my Far Far Away quilt! After much harassing by Flickr friends, I've decided to keep this one for myself! It didn't take much arm twisting to be honest. I love it. It's super girly and super soft. With two boys, a husband, and a boy dog my house could use a few girly things! I also got to test out my new fabric labels from Stefanie of Stationery with Style. Stefanie is so sweet and awesome to work with! She designed my blog, cards, labels, stickers, and anything else I can think of to match! Love ya girl! The fabric labels aren't up on her website yet, but just email her and she can create custom colorfast labels for you in any size/style and with whatever you want on them! I'm going to see if I have enough of the purple floral to do the shutters in Caitlyn's new room. Eek! I hope so! so glad you kept it! 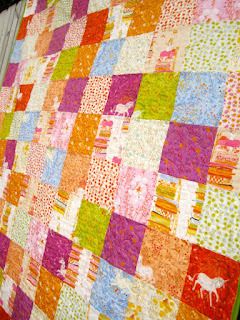 And I love the baby quilt... too cute. :) And glad to see you're living up to your nickname. so glad you decided to keep it! it is so pretty and i can't believe you finished that in 4 hours! holy amazing batman! I'm glad you kept the FFA quilt for yourself! You deserve it! And you may have just set the new record for fastest quilt completed! !